Everybody poops, and for thousands of years, humans have sought better ways to dispose of it. Over the centuries, the toilet has evolved from a hole in the ground to a high-tech appliance offering the ultimate in comfort. Let us take you on the fascinating journey of the humble john. Archaeologists have found the remains of at least 15 toilets located in the upper stories of homes in the lost city of Pompeii. Although the ancient Romans had developed sewer systems in many of their cities for carrying away excess rainwater, their toilets were not connected to the sewer lines. Instead, waste dropped directly into a cesspit. Today, a leaky toilet upstairs can cause a lot of damage before you identify the cause of the problem. Here’s how to find and repair hidden plumbing leaks. Doing your business was not always the solitary activity practiced today. This men’s public latrine in Ostia, Italy accommodated 20 behinds. The “toilet paper” of the day was a communal sponge on a stick. By the way, you’re hanging your toilet paper wrong. You’re welcome. A toilet in a castle was known as a garderobe. Located next to the master’s bedchamber, the garderobe was private and convenient. Waste dropped directly into a cesspit or the castle’s moat below. With that large, straight discharge pipe, Harington’s toilet appears a lot less prone to clogging than today’s. Here are 12 things you should never flush down the toilet. Alexander Cummings, a Scottish watchmaker, improved on Harington’s design by inventing the S-trap, which retained water in the bowl and prevented noxious sewer gases from escaping into the room. His toilet was patented in 1775, and people have been plunging clogs out of traps ever since. Clearing a clogged toilet is a life skill everyone should have. Here are the basics. As an installer of water closets based on Cummings’ design, Joseph Bramah noted that toilet water in London homes tended to freeze in the winter. He solved this problem by replacing the valve with a flap to seal the bottom of the bowl. Also, in 1778, Bramah invented the first float valve for the flush tank—which allowed water to flow into the tank when empty and stop when full—and people have been jiggling toilet handles ever since. Does your toilet run constantly? Here’s how to fix it. The rim-flushing toilet first appeared in 1854. Water streaming out under the rim helps clean waste from the sides of the bowl—and people have been scrubbing at rust stains under toilet jets ever since. Here’s the best way to remove rust and hard water deposits from under the rim. No indoor plumbing? No problem! Dig a deep hole, put a seat over it and enclose it for privacy, and you’ve got yourself an outhouse. The outdoor toilet was commonly used in America until electricity came to rural counties in the 1930s, and then indoor plumbing was not far behind. With plumbing comes plumbing problems. But, you can fix many of them yourself. See the top 10 plumbing fixes everyone needs to know. The Victorians discovered that toilets flushed better when gravity forced the water into the bowl, so they mounted tanks high on the wall above the toilet. Contrary to popular lore, Thomas Crapper did not invent the toilet, but he did sell them. He opened the world’s first bathroom showroom in Chelsea, England in 1866. At the time, it wasn’t proper to talk about toilets, much less flaunt them. Crapper brazenly displayed white porcelain toilet pans in his store windows, causing some ladies to faint at the sight. Most toilets still use gravity for flushing. Check out these ways to improve flushing power if your toilet just isn’t doing the job. 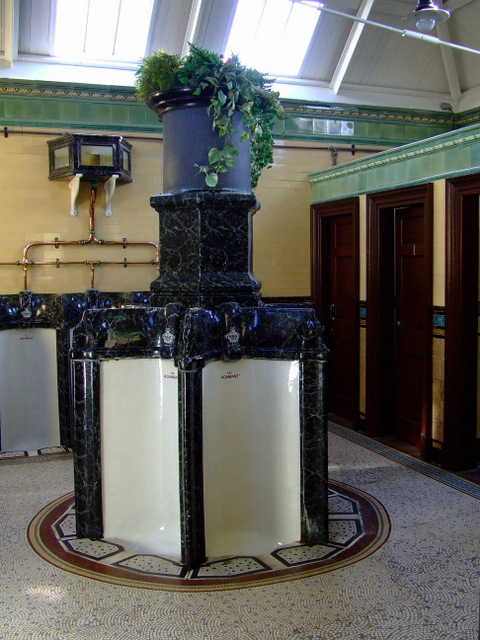 These splendid urinals were installed in a gentlemen’s public toilet constructed in 1899 in Rothesay, Isle of Bute, Scotland. Restored in the 1990s, they are still fully functional and in use today. Urinals are fine for public restrooms, but did you know they can actually decrease the value of a home? Don’t do these things if you want to sell your house. By the beginning of the 20th century, the tank had been lowered from the wall and connected with the toilet bowl into a two-section unit. It’s easy to see how our modern one-piece toilets evolved from here. What should you consider if you’re shopping for a toilet today? Here are some tips. Today, your toilet can have not only a heated seat, foot warmer and music streaming through Bluetooth speakers, but also a motion-activated seat and lid and a connection to Alexa. Kohler’s Numi intelligent toilet retails for $7,500. Read more about Kohler’s new smart bathroom products.